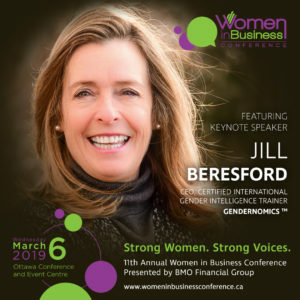 #WIBC2019 welcomes Jill Beresford - The 11th Annual WIBC is proudly supported by the Women’s Business Network. The 11th Annual WIBC is proudly supported by the Women’s Business Network. The science behind gender differences. Jill founded Genderversity after earning an MBA from Boston University and 20 years thriving in male-dominated corporate environments. She learned that businesses that consider female senior leadership equal to male leadership outperform those that don’t. Genderversity has been educating business on the financial impact of gender diversity using leading-edge, international gender science since 2014. Genderversity applies why and how to our gender differences, thereby ultimately maximizing corporate profitability. Only 5% of publicly held companies are led by female CEOs. Jill has encouraged and supported women to own their potential and rise through the ranks since the early 1990s. Intuitively we know we are different than men, but it is only with the recent advances in neuro-science that are we able to understand how to work and succeed in business with these differences. Men and women are engineered very differently. Neither gender is better or worse… only different. Three ways to start capitalising on these differences today. I was a female CEO working with an all-male Board and Management Team, and many times I felt like a stranger in a strange land. I wanted to understand how we could communicate in the same language and yet have no clue what the others were saying. Men are not going to pave the way for us. We have to do it our way and help each other. Men are not to blame. The ‘Rule of Three’ for optimal success in getting ahead in a male-managed world.